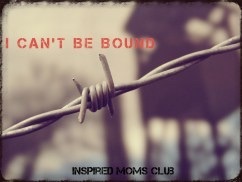 This post was written on Inspired Moms Club by Cindy and we wanted to share with you! In life, the words above from Lauren Daigle’s song “How Can it Be” are a constant reality as we go throughout our days. We see and know all to well our shortfalls, our sin, and we hold on to false truths of unworthiness. We want to carry our weight and our burdens as a constant reminder of who we are opposite of Christ and we can’t comprehend the true meaning of the cross. Knowing we are not good enough before God, we refuse to approach Him in prayer and worship believing He wouldn’t give us the time of day. I too am guilty of this but I am learning in Christ I can’t be bound!